In just the last couple of weeks, the Akkroo team has visited huge trade shows and exhibitions in Las Vegas and Germany, as well as here in London. If, like me, you’re always heading out to these big trade shows, you’re probably after one thing: leads. So I’ve worked with the rest of the Akkroo sales team to pull together our 30 top tips for getting the best leads at every show you go to. Some of these will (hopefully) be obvious if you’ve been exhibiting at trade shows for any length of time. So many companies send the same team to every single trade show they exhibit at. Would you make the exact same phone call or send the same email to every single sales lead? No. Think about who the attendees will be at each event, and tailor your event team to fit-in with that. For example, if it’s a show aimed at marketers, they’ll love being able to speak to a ‘kindred spirit’ on your stand. It’s very daunting for an attendee to walk up to a stand which has twice as many booth staff as it does visitors. Likewise, if you’ve not got enough staff and your stand has huge queues, people will likely give you a miss. Consider having a few people on ‘standby’ who can up your booth staffing levels if the event is much busier than expected. Refresh your knowledge of your company’s whole product offering. You may not need to know about every single item in detail, but you should at least be able to talk confidently about the types of product or service on offer. What does a hot lead look like? What is the difference between a qualified lead, who deserves immediate follow-up by you personally, and a lower-priority lead (perhaps someone who’s not ready to buy yet because they don’t have budget for the next six months) who should be passed over to your SDRs for nurturing? Are there customers at the show, who you should spend some time with to build-up that relationship? Or prospects you’ve been speaking with for several months? Book those meetings in and get them in the calendar so all the stand reps know when you will and won’t be around. Do you want hundreds of people coming to your stand because they’ve seen someone else walking around with a stress ball, stuffed toy, drone – or whatever other ‘cool’ freebie you’re offering? Or do you want people coming to your stand for your expertise and to talk to you and your colleagues? Everyone knows the WiFi at trade shows is terrible. So make sure you’re not going to be relying on it, either for elements of your stand, or for your lead capture. I’ve seen so many companies at trade shows using web forms for lead capture, who have then had to use scraps of paper to collect leads when the WiFi doesn’t work. If you’re using an app for event lead capture, make sure it works offline. Work with marketing when they’re putting together the form for you to use at the trade show. You’ll know how your conversations go with prospects, and they’ll know what data and fields are needed to get leads into your CRM. Work together to make sure you’ve got a form that works for both of your departments. You need to understand the big business goals for the trade show, in order to get the most out of it. Are you going there for lead generation? Are you going because it’s an industry-leading show and your presence is (almost) required? Are you going because someone from your company is speaking, so more for awareness than for collecting leads? Your targets should reflect that. It may be tempting to leave all the planning to marketing, but then you’ve got no say in the stand design, staff rota, or lead capture form. Having regular planning and progress meetings in the run-up to the show makes sure that everyone is aligned on the goals of the event, and aware of all the on-the-day logistics. 11) Who’s on the stand with you? Think of it like a team sport, not an individual event. Knowing who else is on the stand with you makes it easy to bring in other team members if you’re faced with a really difficult question, or you’re speaking to someone who worked at a company where one of your colleagues used to work. You want the right person speaking to the right visitor, as much as possible. Everyone should have regular breaks when they’re on the stand. You don’t want energy levels to dip, because that will affect your ability to have engaging conversations with visitors. Make sure everyone take their breaks, and that you stick to the rota. Otherwise you’ll leave the rest of your booth team short-staffed, which will make things harder for everyone. The thing I hate most at events – but see all the time – is reps on stands who don’t want to talk to the attendees. They avoid making eye contact, even when someone’s hovering at the edge of the booth, clearly wanting to talk to someone. Everyone on your stand should be happy talking to visitors, and starting conversations with passers-by. Whenever I, or my colleagues at Akkroo, exhibit at a trade show, we ask for tables to be taken out of our stand. Don’t sit behind a desk or a table – it puts a barrier between you and the event attendee that you want to speak to. It may seem like a small change, but it makes a big difference to how you look from outside your stand. Sure, you want to look your best when out on the stand, but this isn’t the time for towering heels or new shoes that pinch your toes. Wear shoes that will still be comfortable, right at the end of the day, even after you’ve walked the length of the exhibition hall(s). Otherwise you’ll be talking to prospects and thinking about how much your feet hurt, rather then giving them the attention they deserve. If you’ve got some time to kill before the trade show opens its doors to attendees, take a few minutes to get to know your neighbours. What is their product or service offering, what are they trying to achieve by exhibiting at this trade show, and what does an ideal customer look like for them? You might find that in the course of your conversations you’ll find yourself talking to someone who’s a good-fit lead for them – and they might return the favour. I know it can get really busy on the stand, particularly at the biggest trade shows, but all the more reason to take regular breaks to get something to eat, and get some fresh air if possible. Staying hydrated is also essential – don’t be tempted to fuel up on all the caffeine to get through the day; often your energy levels dip if you’re dehydrated, so fill up your water bottle instead. You don’t always need to wait for someone to approach you to speak to them. You and your colleagues on the stand should be confident enough to speak to trade show visitors and kick-start the conversation yourself, rather than passively waiting for people to come to you. Having a conversation with a great-fit prospect who’s very engaged with everything you’re saying? Make the most of this opportunity and book in your next conversation – be it a face-to-face meeting or a phone call – there and then, on the show floor. Keep that conversation going! When you’re speaking to a customer at your stand, let them do most of the talking. Take the time to get to know them: find out why they came to the trade show today, listen to the problems or challenges they’re looking to solve with your product, and give them an opportunity to explain, before jumping in with your sales pitch. Wherever possible, try to avoid showing your generic sales pitch or product demo. Chances are, this won’t be relevant to the person you’re speaking to. Everyone has their own requirements and problems they’re trying to solve with your product. So take the time to learn more about their challenges, and as you walk them through your product, reference how certain features meet their personal requirements. I see so many reps at shows let down by their lead capture processes. Their slick webforms don’t work on the overloaded WiFi, so they have to collect leads manually on whatever scraps of paper they’ve got to hand. If you’re using a digital lead capture process, make sure it works offline as well as on WiFi. And ideally, have a system in place so that when you’re back in the office you can start following-up with the hottest leads right away. Are you still waiting for weeks after a show, before your leads are typed up and into your system? By the time you’re able to follow-up that lead’s gone cold, or gone with another vendor – who was quicker to reach out. Is it up to marketing or sales to follow-up with leads from trade shows? Does each rep follow-up with the people they spoke to on the stand, or are all your leads evenly distributed between reps after the show? Different processes work best for different businesses – the important thing is to decide on this before the show, and make sure everyone sticks to the plan after the event. Otherwise you run the risk of some leads getting missed-out, and no-one following up at all. Sending generic follow-up emails doesn’t cut it anymore. Sure, it’s easy, sending the same email to all 300 leads you collected over the course of the trade show, but it’s also instantly forgettable. Your email should be a continuation of the conversation you were having with the prospect on the stand, to keep building up that relationship. How do you know if a show went well? Pick one metric that you look at in the immediate aftermath of a trade show (one of our customers looks at number of SQLs, but you might find that MQLs works better for you), as your early measure of the success of the event. No doubt you already keep a close eye on your sales pipeline, but it’s worth starting to track the leads you collected at the trade show as their own subgroup. It makes it easier to measure revenue and calculate the ROI of your trade shows and events if you track event leads separately. We use the Event Qualified Lead (EQL) metric to help with this. If you’re tracking your event leads through the sales pipeline, you’ll be able to calculate exactly how much revenue your presence at the trade show generated. 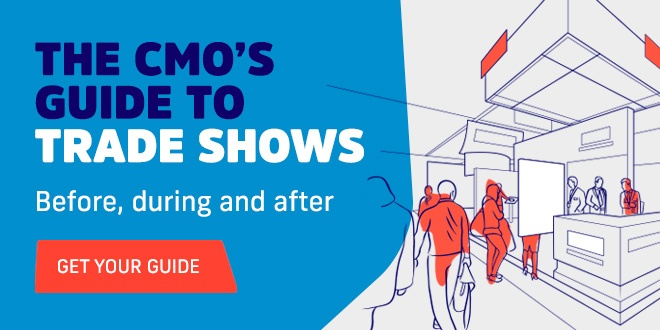 Obviously you won’t be able to do this immediately after a show, but it’s important to track this so you can measure event performance, just like all your other sales and marketing channels. If you can calculate how much revenue you’ve generated from exhibiting at a trade show, you can calculate your return on investment. This will be one of the most important numbers for your boss to report back on, to justify your company’s budget for trade shows and other events. Once you know the ROI of each event you go to, you can set a benchmark for whether an event is worth investing time and energy into exhibiting at. You might find that smaller, roadshow-style events provide a better return than huge trade shows, or the opposite may be true. Or you may discover some shows where you’re wasting your budget, and others that offer such a good return that you should send more reps next year. These tips should help your events team make the most of every trade show you exhibit at. If trade shows and exhibitions are a big part of your marketing activities (and budget), make sure they’re integrated with the rest of your marketing efforts, not left out in the cold.